Death Marshals were the models that actually brought me to Malifaux. 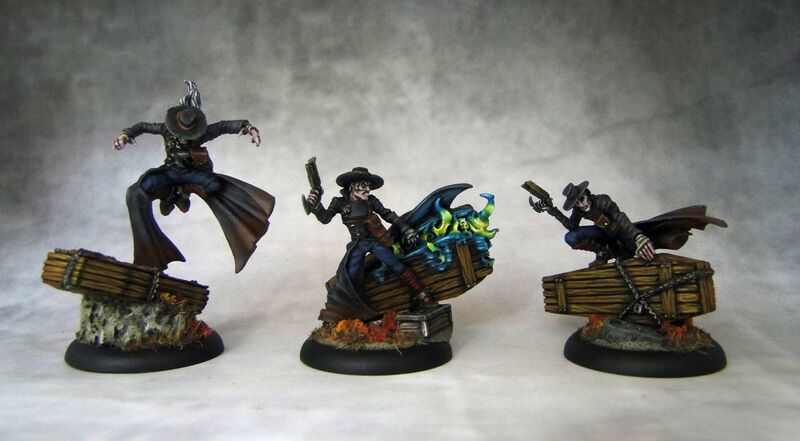 In particular the leaping one (that was also featured on the cover of first rulebook drew my attention a few years ago and I ended up buying Justice's crew. Since then I've solf off my Guild collection and switched to Neverborn but Death Marshal models have always been among my favorites. That's why it felt good to work on Death Marshal Recruiters. 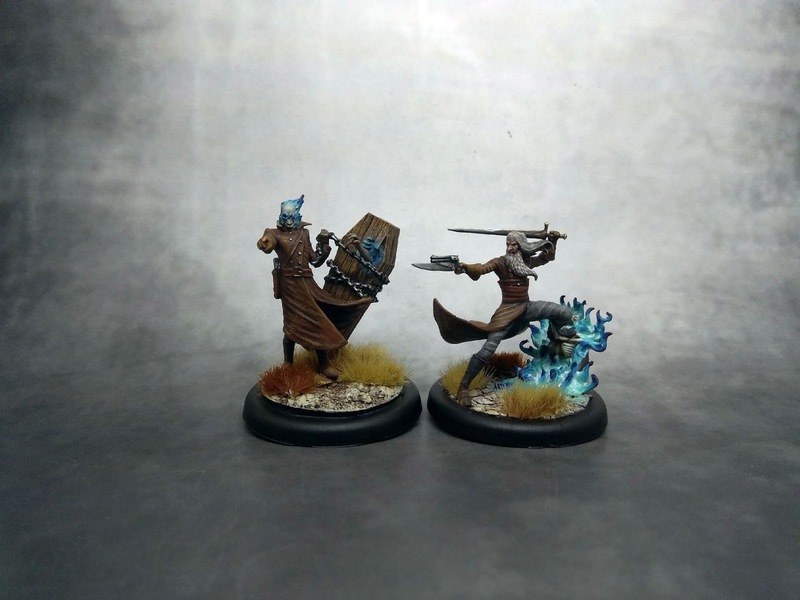 These 7 ss enforcers bring a few nice things to Lady Justice's crews. First of all, their "Not Today, Lads" allows them to discard a card to prevent another friendly Guild Marshal within 4' from dying. It can be really huge and can potentially save your master from certain death. They have only 7 wounds but Hard to Wound should keep them alive for a while longer. Their attack action are a solid 6 Ml and Sh but the great thing is that (if they discard a single card) they can attack buried models. They also have two neat (0) actions. The first one allows them to push up to 5' towards enemy (and allow other friendly engaged model to take (1) Attack action on a trigger). The second one causes a friendly non-leader to gain the Guild Marshal characteristic until the end of the turn. It basically means that you can use that on your expensive beater model and make sure that even in worst case scenario you can always keep it alive as long as your Recruiter is within 4' and has some cards to spare. The miniatures come on 40 mm bases and are a bit bigger than standard Marshals. Each has a distinctly different sculpt. The skull one is to me one of the most iconic models from the range that has a lot of character to it. The other one has a lot going too as there is a partly open coffin next to it with a skeleton reaching out from the inside and clutching its leg. 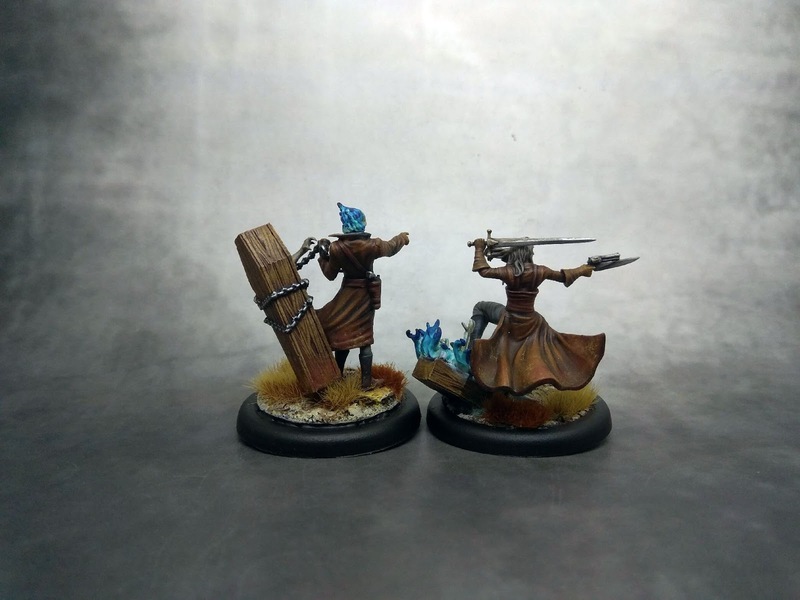 Both were a lot of fun to work with but now that I'm done with a batch of Guild models, I'm happy to turn my full attention to my Neverborn collection again.